It’s cheaper. In many markets rental costs can be quite low compared to mortgage costs, making renting an attractive alternative. A lower payment every month gives people the ability to pay off other debt, making it particularly attractive for younger people with student loan or credit card bills. It’s flexible. Renting allows individuals to quickly move in order to accept job transfers or pursue other opportunities. They can often sublet the rental or simply work with the landlord to break the lease early. Buyers that are caught in down markets might not be able to accept a loss, so they get effectively stuck in their homes. No maintenance. This is a classic benefit of renting that can really add up. If the dishwasher breaks in a rental, then you simply call the landlord. Avoiding repairs and maintenance is a considerable cost, especially if you purchase a home that requires more substantial work. No real estate taxes. A $500,000 home in Southern California can also have property taxes of $6,000 to $8,000. This represents an extra $500 or more a month for homeownership. Dive in the pool. Many apartment complexes are offering gyms or pools to attract renters. These amenities would be very costly in a private residence, and represent considerable value for renters that want luxury without the burden of a big mortgage. Tax benefits. Despite some calls from politicians to remove it, the mortgage interest deduction likely isn’t going anywhere. This deduction can be significant, especially for those filers with expensive homes with a higher tax bracket, as it helps people stretch to afford higher-priced areas. Fixed payments. Renters can often expect an annual (or once every two to three year) increase in their rental rates. Homebuyers that purchase a home with a 30-year mortgage can lock in a fixed rate (excluding any rise in property taxes). The benefits are even greater for those borrowers who can swing 15-year loans. Interest rates remain low. The cost of buying is still historically low, which makes buying an attractive investment for the long term. If rates rise, then renting begins to look more appealing, especially in pricier markets in California and New York. Pride of ownership. This is a more intangible benefit that comes from owning something instead of renting it. Owners typically spend more time on cleaning and improving their homes which helps instill a valuable sense of pride. Price appreciation. When renters occupy a property, they don’t stand to gain at all if the price of the condo/house goes up. In fact, this will likely cause the landlord to push for more frequent or higher price increases. Appreciation does of course help the owner by boosting the value of the property and giving the homeowner a financing option through equity. When comparing rentals against available homes, be sure you do a true apples-to-apples comparison. 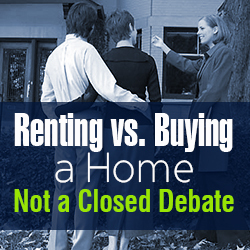 Judging the cost of a two bedroom rental condo versus a three bedroom home with a big yard isn’t a true comparison. Look at comparable properties in order to best judge the true costs of each option. Another thing to consider when buying a home is something economists call “opportunity cost.” In this context, the cost relates to the investments you could have made with down payment money if you rented instead of buying. So if you spent 20 grand on a down payment and stayed in that home for 15 years, then you could look at how much that money would grow under different investment scenarios. You typically need a security deposit for a rental, but that’s a much lower sum and is returnable if the property is left undamaged. Buying often makes more sense for people that are planning to stay in a neighborhood for a long period of time. Home buying has many upfront costs (agent fees, taxes, etc. ), so a longer time frame means those costs are spread out, so they annualize to a fairly low amount. Buying a home requires an investment in time and money, which can be hard to justify if you plan on leaving in a few years. How To Rent Or Sell Your Home During A Financial Crisis? 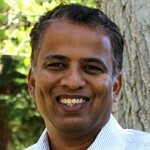 Nitin Shingate is a distinguished technologist with experience building scalable platforms that leverage open source systems at Xerox and United Online. Nitin was previously the VP of Technology at United Online, a leading provider of consumer Internet products and services, including FTD, NetZero, Classmates.com, and MyPoints where he developed blazing-fast web systems. Nitin is a software product and engineering leader with 20 years of experience directing cross-functional teams of technical experts to build and deliver enterprise and consumer software. Nitin currently manages product and technological development for RentalRoost.com, Houserie.com, and their partnerships. RentalRoost is the first house and apartment finding engine that generates recommendations based on lifestyle. With over 20 search dimensions, RentalRoost’s proprietary patent-pending algorithms deliver an intuitive and precise search experience. Based in Pleasanton, CA, RentalRoost was founded by Nitin Shingate, Vikram Raghavan and Harini Venkatesan, three entrepreneurs with a vision of making the daunting task of house hunting easier and much more efficient. RentalRoost’s sister site Houserie provides a fast, secure and comprehensive tenant screen service for landlords.